For Cuisine Noir Magazine. October 2018. 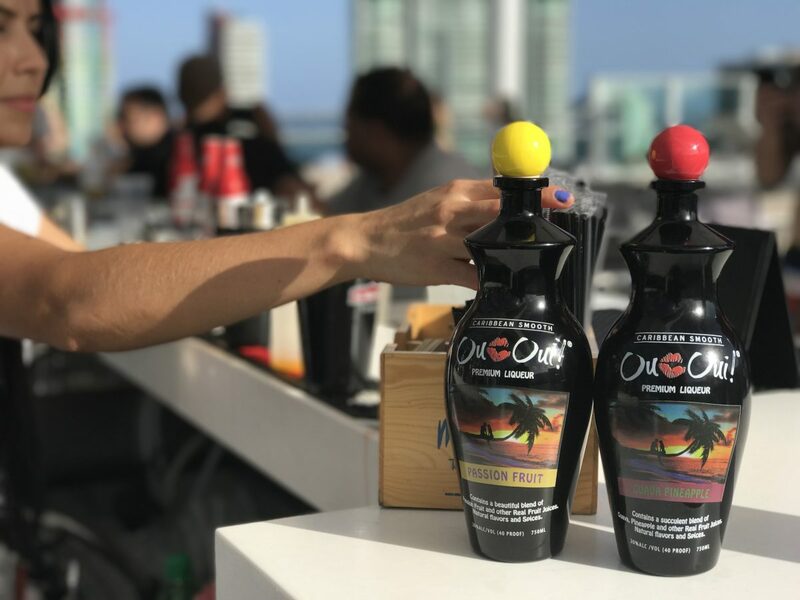 The founder of Caribbean Smooth, a new brand of tropical spiced rum liqueur, shakes an unusually shaped black-colored bottle and pours me a taste of his guava-pineapple and passion fruit blends as we chat sitting at the bar of a Mexican restaurant near his home in Atlanta. “This is an instant rum punch,” he says mixing the two flavors and adding a splash of ginger ale. It is Ou-Oui! Walwyn uses fresh pink guavas and pineapples from Central and South America and blends them with spices from the Caribbean to create a smooth liqueur that is easy to drink straight from the bottle. There’s no burn from the alcohol, just a little heat and a slight buzz. With 20 percent alcohol and all natural ingredients, there’s nothing else like this on the market. Growing up on the island of St. Kitts, Walwyn picked mangoes, bananas, coconuts, sugarcane and guavas from his backyard, eating them fresh and juicing them for a sweet treat. “Even as a kid, I created my own juices, spiked them up with my dad’s brandy, not for a buzz, but because I enjoyed how it changed the flavor profile,” he recalls of his first experiments. After his father migrated to neighboring St. Croix in 2010, Walwyn would make a passion fruit cocktail for his friends and family, which was fondly named ‘Nigel’s Punch.’ It was inspired by a rum punch he had tried at a beach bar (formerly Ziggy’s) in St. Kitts, that he considered the best in the world. Word spread and before he knew it, people were asking him to make this special recipe for their events. He made three gallons for the St. Kitts Music Festival’s VIP tent and the crowd demanded more. “The people of St. Kitts are the harshest critics of rum drinks, and that’s when I knew I was on to something,” says Walwyn. Soon requests poured in from colleagues at CNN in Atlanta where Walwyn worked at the time. With the encouragement of friends, he said goodbye to his 25-year-long career in TV news to become a beverage entrepreneur. It took three and a half years of research, product development and getting certifications to bring the taste of the islands to the market. “I hit many roadblocks while I was going through the process by myself. It was frustrating at times, but I knew I was learning and doing something new and exciting,” he adds. When Walwyn was testing out his recipes, people would taste test and say, “Oh yea!” It was an expression he repeatedly heard, so he decided to call the product Ou-Oui! I asked Walwyn about the unusual shape of the curved black bottle with a lipstick mark on the logo, colorful round bottle caps and picture of a couple on a sunset beach. “Ou-Oui! is designed for women. Women like romantic, flavorful, smooth alcoholic drinks. They are put off by strong burning spirits like scotch, whiskey and tequila. It comes in an easy to hold, curved feminine glass bottle. The dark bottle is functional, preserving the freshness of the fruit by blocking UV light,” he explains. The bottle can also be recycled and used as a vase, lamp or candle holder. Walwyn recommends using Ou-Oui! as a base to enhance any cocktail recipe. You can add it to cognac or whiskey, margarita or mojitos – it doesn’t matter. Create an instant rum punch by mixing two parts passion fruit, one part guava-pineapple and a splash of ginger beer or ginger ale and pour it over ice. Add to Champagne and make a healthier mimosa. Each Ou-Oui! bottle has 14 ingredients already, so there are enough flavors and complexity to boost your cocktail. Shake the bottle well as the real fruit tends to settle at the bottom, refrigerate once opened. Ou-Oui! is manufactured in Florida and currently available at 200+ stores in Alabama and Georgia. It is available during select food festivals and Caribbean events. With only a year after the release of the brand, Walwyn is already working on creating new flavors (mango is expected to launch in 2020) and raising additional capital to expand the brand nationally. To see where Ou-Oui! is available, visit www.caribbeansmooth.com and also follow Walwyn on Facebook, Twitter and Instagram. For Creative Loafing Atlanta. September 2018. For Creative Loafing Atlanta. October 2018. Check out some of critics picks in the Oral Pleasure section of the annual Best of Atlanta competitive countdown. Full story in print. For Creative Loafing Atlanta. April 2018. Chef Lotfi Chabaane spends each day at a retirement community called Parc at Duluth. At 60, he’s the place’s de facto spring chicken, telling stories, dancing, and cooking for the seniors who live there. What he’s cooking are Tunisian, Indian, French, Malaysian, and German dishes, but his patrons often don’t know that. Chabaane disguises so-called “ethnic” foods with familiar descriptions, and serves them to people who may never have eaten international food before. That’s his mission: to expose retired folks to brand new cuisines in the most accessible way possible. And thus, to share a bit of his own life. Born in the small coastal town of Menzel Temime, Tunisia, located on Africa’s northernmost tip, Chabaane began working from a young age in order to help support his family. He lost his father at just five years old, and, as the eldest son, had to step up and hustle his way through busy markets selling his mother’s lemonade and brik, a traditional stuffed pastry wrapped in phyllo dough and deep-fried. Growing up in a house full of women, Chabaane learned to cook by watching them. He would dry pasta, tomatoes, and olives; cure meats; preserve lemons. He also made some money shelling peanuts, seeding peppers, and plucking chickens for the neighboring farmers. Life was not easy, but it laid the foundation for his future career. After attending a presidential sponsored high school in Tunisia, Chabaane went on to earn a degree in engineering but could not find a job in his field due to the country’s unstable economy. Instead, he worked at a resort doing anything he was asked — busing tables, serving drinks, folding chairs. Then one day, he met an English couple who invited him to work at their hotel in the seaside town of Devon. Starting as a bartender, Chabaane trained at the Imperial Hotel in Torquay as a waiter, and then a maître d’. He enjoyed entertaining people with food, and became particularly fond of tableside cooking — flambéing steak Diane and crêpes Suzette, carving lamb, tossing Caesar salads. “That’s when I realized I could cook!” he says, with a laugh. He also realized that his new skill set could act as his ticket around the world. Chabaane finally got a degree from the Culinary Institute of America in Hyde Park, New York, in 1992. From there, he snagged gigs at the Department of Defense in Germany, then a French restaurant in Florida. He catered alongside Oprah’s former chef Art Smith in Tallahassee, and headed the dining room at Cherokee Town and Country Club in Atlanta. Eventually, he’d made a big enough name for himself to open two Atlanta restaurants: Couscous, a Tunisian bistro in Morningside, and Perla Taqueria, a Mexican taco joint on Piedmont Road. But after five years of running the two restaurants, Chabaane decided to close down both. There was a revolution going on in Tunisia, one that would eventually mark the start of the Arab Spring, and he needed to go back there to be with his family. TUNISIAN CHEF: Chef Lotfi Chabaane of Parc Duluth. Photo by Erik Meadows. In February 2018, Chabaane hosted a fundraiser for my Atlanta-based nonprofit, Go Eat Give, where he cooked homestyle Tunisian dishes such as spicy carrot salad, chicken tagine stew in a traditional clay pot, and vegetable couscous. In this way, the chef was able to recreate his childhood memories of eating big weekend lunches, sharing stories, and surrounding himself with people. Though some of the attendees were generally familiar with the region, none had ever tasted traditional Tunisian food before, which stands apart for its European influences. Chabaane was proud to serve it to them. ~ Written for Creative Loafing Atlanta. April 2018. Airport food doesn’t always have to be greasy fast food, pre-packed sandwiches, and run-of-the-mill chain restaurants. Over 100 million passengers fly through the world’s busiest Hartsfield-Jackson Atlanta International Airport each year, and they have several options where they can taste local flavors. While most travelers don’t have enough time to step outside the airport and enjoy Atlanta’s eclectic food scene, they can get a pretty good glimpse of it inside the seven terminals. Check out these local restaurants inside Atlanta airport. Step back in time and visit one of Atlanta’s classic restaurants since 1947. This soul food establishment is known for award-winning fried chicken, and the city location was a meeting place for key civil rights leaders and strategists including Dr. Martin Luther King, Jr. and his lieutenants. Established by a Cuban refugee, the Cuban grill has a takeout counter to grab a quick ropa vieja sandwich with black beans and yucca fries. Sip on a mojito at the bar, enjoy Latin music, and pick up a fedora at the adjacent shop. Jeff Varasano traveled the world for 10 years perfecting the art of making pizza, eventually moving from the Bronx to Atlanta and taking the local gourmet pizza niche by storm. The restaurant is consistently ranked as a top pizzeria in the nation. The local chain is rated one of Atlanta’s best for burgers and brisket chili. Build your own burger with a wide selection of toppings, or order a Hillbilly Style with pimento cheese and jalapeños, along with distinctive Georgia sides—Vidalia onion rings, fried green tomatoes, and sweet potato fries. This family-run deli started serving New York style bagels in Atlanta in 1972 and has several locations around the city. Serving 32 varieties of bagels and homestyle Po’Boys, along with deli salads, stuffed cabbage, and steamed corned-beef pastrami, this is one of your classic neighborhood Jewish delis. Who doesn’t like unpretentious good Mexican food while on the go? Atlanta’s neighborhood taco stand is always a big hit with travelers, offering simple and fresh Oaxaca-style tacos, big boss burritos, and spicy quesadillas for lunch and dinner. This Atlanta restaurant chain serves gourmet salads, sandwiches, and entrees at casual prices. Co-owner and South African immigrant Pierre Panos is behind the concept of healthy fast food at affordable prices, which is why F2O is one of the most popular lunch spots in the city. If you can’t go check out the biggest drive-in restaurant in the world in downtown Atlanta, you can still get a taste of its legendary burgers and chili dogs. Celebrating its 90th year, the family-owned chain still uses the same recipes for almost a century that even President Obama and President George H.W Bush can’t resist. One Flew South is one of the few upscale dining establishments at Atlanta Airport. The cuisine is defined as “southernational,” inspired by world travels and using fresh, local ingredients. Find everything from chicken noodle soup and Korean style burgers to good quality sushi here. The Jekyll Island-inspired restaurant offers a taste of Georgia’s Atlantic coast with fried crawfish, buffalo shrimp, grits, fresh oysters, and seafood gumbo served with southern hospitality. The only thing missing is an ocean breeze! A classic steakhouse with hearty sandwiches and salads in a casual setting. This is where you can get a fantastic prime rib served quickly. Also, have a business meeting over craft beer in one of their private rooms. Experience a bourbon flight (32 to choose from), cocktails, and whiskey at the Jim Beam (one of the best-selling bourbon brands in the world) co-owned restaurant. Pair it with Southern-style deviled eggs topped with crispy bacon, or a side of brisket. Owned by local Concentrics Restaurants group, the gastropub showcases a taste of Atlanta with dishes such as buttermilk fried chicken, hot boiled peanuts, and shrimp and Logan Turnpike grits. Try local beers on tap, or relax with a porch swing peach punch. Who says you can’t eat healthy on the road? What began as a website about fruit facts evolved into a Pan-Latin fruiteria serving Mexican-style fresh-cut fruit cups, South American-style smoothies, Cuban-inspired sandwiches, Mexican paletas (fruit popsicles), and Ecuadorian ice creams. If you are craving something sweet, head over to one of Atlanta’s legendary bakeries, Piece of Cake, for rich slices of coconut, banana, and pound cake. They also have cupcakes, brownies, cheese straw,s and cookies baked daily. ~ Written for Chowhound. February 2018. You know you are in the South when you hear men and women screaming “what’ll ya have, what’ll ya have?” as they move you down quickly through the line. If you don’t respond quickly, you’ll be sent back to the line. Sounds like a high school cafeteria? This fast food restaurant is close to it! With James Beard-nominated chefs, award-winning restaurants, and a myriad of international eateries, the dining scene in Atlanta has changed dramatically over the last few years. But one thing has remained constant for nearly a century—The Varsity. The Varsity in downtown Atlanta is the biggest drive-in restaurant in the world, covering two city blocks. The multi-level car park can accommodate 600 cars. No one can miss the V-shaped red neon signs with a ‘50s college tailgate feel and barhops dressed in red jackets while driving past Atlanta on I-75. Inside this huge space, it is always loud and busy, as you would expect during recess. The seating downstairs is made to look like classrooms where you can enjoy your tray of burgers, fries, and drink seated at your desk. The Varsity in downtown Atlanta alone serves an average of 15,000 people a day (twice on game days) and more Coke than any other restaurant in the world. In the 1950s and ‘60s when drive-in culture was trending, The Varsity parking lot was not just one of the best fast-food restaurants; it was a place to socialize with friends and go out on a date. “Where else would one eat in Atlanta? It is an experience, an institution!” says Robert Howarth, a semi-retired real estate professional who was a regular at The Varsity when attending Georgia Tech during the ‘70s. The fast food chain now has seven store locations (including two at Hartsfield-Jackson International Airport) and four food trucks in Georgia, and it remains family-owned and operated. Ashley Weiser, marketing director and granddaughter of Frank Gordy, attributes their success to having great food at a great price consistently over the past 90 years. “Not much has changed over the years and that is one of the things that makes us special. We still serve the same menu items, using the same secret family recipes,” she says, referring to a plain hot dog costing $1.59 and a hamburger at $1.89. Though the menu has gone through very little changes, recent additions include triple stack bacon cheeseburgers and two salads. While gourmet farm-to-table hamburger restaurants are popping up around the country and fried food is getting less trendy, The Varsity is serving original recipe chili-dog combos, pimento cheese sandwiches, and sweet peach iced teas. “Food trends always come and go but we remain the same and that is what people love about The Varsity. Our business remains steady no matter what new trends in food service appear because we offer delicious quality products and that will never go out of style,” says Weiser. Even President Obama and President George H.W Bush have stopped by to eat chili dogs at The Varsity in Atlanta. You clearly don’t come here when you’re on a diet. The biggest draw to The Varsity is nostalgia. People who grew up in metro Atlanta have been eating at The Varsity for generations. They have celebrated birthdays, shared family meals, or had their first kiss at the drive-in. Many of them come back year after year because they want to walk down memory lane and feel like a kid again. Of course, the food is good too. Header image courtesy of The Varsity. An American girl travels to Italy, meets a charming Italian man, gets married, and together they live happily ever after. It sounds like a cliché love story, right? Well, it happened in January 2009 when Meredith Hall, a resident of Atlanta, met Luigi D’Arienzo (who goes by Gigi) during a milonga in the medieval city of Siena. Gigi and his friends hosted and attended a tango social each month held in different towns around Italy. They would often cook for 80-100 people and enjoy evenings filled with drinking local wines, dancing, and meeting new people. “The first moment I saw Meredith was emotional. I wanted to dance with her. I didn’t think of anything, I just wanted to be with her. And then it was the best dance I had ever had!” Gigi recalls. Since then, the couple has been dancing and teaching others around them how to savor the good life with their family-run Italian café in Atlanta and curated culinary trips to Italy. Tuscany at Your Table commenced as a home-based cooking school offering small groups a chance to experience regional dishes from around Italy, honing on Gigi’s background of running an agro-tourism farmhouse in Tuscany. “Each week we would tour a different region of Italy through our palates,” Gigi says, teaching Italian food lovers how to cook carbonara from Rome, chickpea soup from Tuscany, and migliaccio (ricotta cake) from Naples. Those who wanted to dive deeper into the country’s rich culture embarked on trips to Sicily and the Amalfi Coast with the young couple. After over 100 cooking classes, the city demanded more of Gigi’s original recipes demonstrated in a southern Italian accent with his sweet wife baking crostadas by his side. They rented a storefront in the trendy Virginia-Highlands neighborhood, known for funky boutiques and notable restaurants. Gigi now spends his days making homemade pastas, simple sauces, and delicately layered paninis, while Meredith specializes in desserts. The menu changes daily and is based on seasonal ingredients. Soups, salads, and pastas can be bought by servings or weight to take home for dinner. There is also a storefront selling Italian imports such as olives, chocolates, wine, cheese, prosciutto, and ceramics. While there’s not much room to dine-in, Tuscany at Your Table becomes a neighborhood hangout in the evenings. Cooking classes, wine tastings, and tango nights are what draw singles and couples into the shop. Regular customers come in each week and meet new people from the community. They bring friends and celebrate birthdays over Italian food and wine. Often, Gigi and Meredith offer an impromptu tango lesson and everyone starts dancing. Perhaps someone else will also find their lover at one of these events. Food is an integral part of Gigi and Meredith’s life. Though they work together and have a newborn baby, they take time to have a romantic meal at home from time to time. Gigi prepares orange and fennel salad, champagne and strawberry risotto, and molten chocolate cake, paired with a bottle of Lamùri (meaning love) a fine ruby red wine from Sicily. “We work well together dividing our responsibilities and are compatible at home and work. Even though we are busy, we are happy!” Gigi claims and offers to share his romantic secrets at a Valentine’s day cooking class. Keeping with Italian tradition, on Feb. 15, Tuscany at Your Table will celebrate San Faustino, or “Singles Day” as it is known in Italy, with a cooking class only for singles. Typically, unattached men and women go out for drinks, dinners, and dances in Italy as a retort to San Valentino. Header image courtesy of Rosemary Calli. Khaled and Ruwaida had a deep-rooted life back in Damascus, Syria. They owned two apartments and a few electronic shops. Khaled worked, while Ruwaida took care of their two kids. But political unrest forced them to leave their home country and walk across to Jordan, where they lived as refugees for four years. They lost their assets, sold most of their possessions for survival, and arrived in the United States with almost nothing. One of the few things they could carry with them—a wooden cookie mold from Syria that belonged to Ruwaida’s mother and grandmother—became the foundation of their future. Once the family arrived in Georgia in 2016, refugee resettlement organization New American Pathways and Holy Trinity Parish helped them settle in. Initially, they relied on the help of the community for food and shelter. Amanda Avutu, one of the volunteers who has now become a close friend of the family, says, “I wanted to help stock their kitchen for them when they arrived at their new apartment but was totally lost! I went with an arbitrary shopping list to an Indian grocery store not really knowing what Syrians eat,” referring to how little knowledge she had of the country’s cuisine. Not knowing English and having no transferable working skills, Khaled turned to minimum wage work, while Ruwaida baked cookies for her neighbors, the only way she could say “thank you” for their generosity. Little did she realize; her small sweet tokens would lead her to start her very own business and support her family. The idea of “Sweet, Sweet Syria” was birthed during a neighborhood music festival where Ruwaida sold 45 dozen cookies in three hours from a friend’s porch. “Refugee cookies! Refugee cookies!” her 10-year old son yelled from the porch. It was the first time Ruwaida (now 29) had received money for her work and it took some getting used to the idea of being the first Arabic businesswoman in her family. “I was so excited and my kids seemed so proud of me” she says, smiling shyly. “We Syrians think about food since the time we wake up,” Ruwaida says, and recalls fond food memories of her home country. She has been baking traditional Mamool cookies since she was 12 years old. Her mother taught her how to make the shortbread dough, season it with orange and rose water, and stuff it with dates, pistachios, chocolates, and coconut. The recipe has passed on through generations. It’s a 10-step labor intensive process and good quality ingredients are crucial. The cookies are delicate, flavorful, yet not too sweet. “Do you want to work?” Ruwaida’s new American friends asked, and sought permission from her husband to be sensitive to her conservative cultural background. He immediately said, “Yes, but only in the house.” With much help from a Google translator, her advisors helped set up her website, took her for English language lessons, and enrolled her in a business accelerator program. Since they did not have an outlet to sell, Avutu would sit at a neighborhood coffee shop to meet with customers and deliver the cookies they ordered through word of mouth. “I felt like a smuggler of cookies!” she laughs. The owner noticed this and signed up for a weekly order and gave Avutu a corner at the shop to meet with customers. Next, they bought a tent, table, and sandwich board and headed to the farmers markets. The entire family was positively motivated when they saw people from all walks of life enjoying their homemade delights. They started receiving messages from people across the country who were eager to try the cookies, and they shipped the cookies via UPS. Ruwaida’s friends also started a crowdfunding campaign to help her rent a commercial kitchen. She now supplies cookies to local coffee shops and farmers markets in Atlanta, and takes online orders ($10 per dozen). Her husband/sous chef assists in running private Syrian dinners at friends’ homes that serve as a place for cross cultural exchanges. The kids get a chance to see other American homes and share their own backgrounds. In less than two years since their move to the US, Khaled and Ruwaida are loving their new entrepreneurial lives and eventually want to open a small brick and mortar Syrian restaurant. Header image courtesy of Sweet, Sweet Syria. Written for Chowhound. January 2018. For Creative Loafing Atlanta. December 2017. Seewai Sayavong welcomes me into a 12,000-square-foot Victorian mansion overlooking 15th street. “Tennessee Williams has lived here!” she says. Upon further research, I find that no one is quite sure whether this factoid is true or not, but the building, often referred to as “the castle,” was indeed a residence for many Atlanta artists back in the day. Sayavong, who hails from Laos and was once general manager for Thai fine dining concepts Nan and Tuk Tuk, gives me a cheerful tour of the newly renovated space. It’s clear she enjoys her new gig as assistant manager for Rose + Rye quite a lot. The space spans four stories, each with original hardwood floors, dramatic stone walls, and contemporary white and dark merlot contrasting furniture. The ground level, known as “the Grotto,” serves as a bar and lounge area where Keefe plans to showcase Atlanta artists and project classic black and white movies, keeping true to the building’s origins. One can totally picture a bunch of aficionados standing on the large patio overlooking Woodruff Arts Center, drinking wine and talking about the latest exhibits. On our tour, Sayavong also shows me the bedrooms upstairs; each is marked by a state emblem and all are now open for private parties of various sizes. My server, Kat, recommends True at First Light ($14), a vodka mojito with champagne bubbles. She tells me that the staff gets a free drink at the end of each shift and this one, both solid and refreshing, is a popular choice. If you are not a whiskey drinker, the signature Rose + RYE ($13) may convert you. Delicate rose water, spicy star anise, and bitter orange peel balance off the edginess of the rye. Despite its male ownership, Rose + Rye is run by an all-women culinary team, from its executive chef to its general manager. “It happened naturally,” says Keefe, noting that he saw a unique opportunity to showcase feminine talent and diversity in an industry often ruled by men. The braised duck ($14) appetizer is an upscale take on typical barbecue, marinated in sherry vinegar and three kinds of peppers (pasilla, guajillo, and ancho chili) and served atop crisp polenta cakes and pickled red onions. The combination of spicy, sour, and sweet illustrates Keefe’s “yin and yang — rose and rye, get it?” theme well. Glazed pork belly ($14) is tenderized with soy sauce for four hours and complements the accompanying Parisian gnocchi. Together, the pork fat and velvety dumplings melt in my mouth like savory profiteroles. Seared snapper ($26) is a bit overcooked and has little flavor, but the rehydrated cherries add a pleasantly sweet touch. Seared tuna ($28) offers the unusual flavor combinations of olive paste and yogurt. Desserts, made in house by pastry chef Charity Everett (formerly of 1KEPT and Revel Pastry Company), also buck tradition. Buttermilk panna cotta ($9) is a bit runny but has surprise fig jam on the bottom that you can sop up with house-made rosemary cookies. A dark chocolate tart ($13) with bacon fat popcorn is bold and bitter with a nice crunch. While Rose + Rye’s menu is still coming into its own, the restaurant’s concept inspires. Rose + Rye, 87 15th St. N.E. 404-500-5980. www.roserye.com. ~ Written for Creative Loafing Atlanta. December 2017.